Whether you have existing kitchen cupboards or cabinets or intend installing brand new ones, making your own fronts to fit on them is a worthwhile option. Relatively easy to make and fit, they can make a tremendous difference to the appearance, smartening up an old kitchen that may have pine or melamine doors or giving a more natural look to mass-manufactured new carcasses. You can use MDF for the methods described and paint the door and drawer fronts afterwards for that hand-finished look, but in this example I have used the hardwood, American white oak, so you will see that the techniques are transferable whatever material you use. Apart from the sawing and planing this is very much a router-based method. Router cutter manufacturers make a variety that is specifically designed for making doors. 1. I chose a standard B&Q 1000mm base unit with a two-drawer add-on pack, but there are other options providing for doors only, more drawers or for shorter-length base units. If you are buying anew, choose what units you really need after careful kitchen planning. If you intend having 'integrated' appliances these too will need doors made for them and attached directly to the machines. Various details can be made and added such as a rear upstand for the worktop, lighting pelmets for cupboards, decor panels for covering exposed carcass ends and so on. Since the doors and drawers are framed with centre panels that are the same thickness or a bit thinner it is usual to prepare the solid timber to about 19mm thick (optional 18mm MDF equivalent). This suits most frame-and-panel door sets which can cope with thinner and thicker material but 19mm is thick enough to resist 'winding' and can still be machined from 25mm nominal thickness boards with care, thus keeping cost down. 2. Cutter sets can be chosen online or from descriptive catalogues so you can make the right decision. While these cutters are reasonably pricey, they do repay their investment quite quickly. Decide on the 'look' of your kitchen. Contemporary or earlier simple Shaker styles require a very clean unfussy appearance so a simple frame-and-panel set without any moulding detail would be appropriate. However, a more 'classical' look would benefit from a moulding detail around the inside of the framing, and there are several different moulding styles to choose from that could suit this need. So for this door we have two stiles at 600 x 60 x 19mm and two rails at 459 x 60 x 19mm. However the bottom stile can be wider if you prefer. So long as your calculations are correct you can accurately work out the panel sizes too. Each frame groove is 9.5mm so take overall door size 600h x 500w and take off the stile and rail widths = 480h x 380w and add on an amount slightly less than the frame groove, say less 2mm all round, thus: 497h x 397w. This size allows the panel to fit comfortably but not too tight. Panel thickness will depend on which cutter type you choose. These can be made in the same way but with narrower rails to suit the shallowness of the drawers; stile width stays the same as it matches the doors. Alternatively you can 'face mould' the drawer fronts, using a bearing-guided face mould cutter running against a template. This method means you just have one piece of timber for the front without any joints present. However it is a dusty machining technique and leaves rounded corners in the moulding which isn't so 'proper'; lastly, the drawer front may bow because there is no frame to hold it flat. It is a useful alternative method though and can be used on doors too. 3. A decent router table is needed, with a big router to put in it. The fence needs to be flat and for scribing cuts will need a sub-fence fitted so narrow component ends can't slip into the fence opening. 4. You will need a mitre fence or square push-piece as well. Do a test cut to establish the correct height for the scribe cut and use a backing piece to prevent tearout. 5. When profiling do a test cut first and adjust the profile to match the scribe part. 6-7. Be careful throughout to machine the correct parts on the correct faces; use pencil marks to make this order clear. 8. For panel raising this will be done in several passes as so much material will be removed. 9-12. A vertical panel raiser needs the support of a tall 'breakthrough' fence; it must breakthrough in order to avoid tearing on the panel face if no support were present. Several passes will help reduce tearing. The purpose of the face mould is to decorate the front but it does not remove any thickness in the middle of the drawer front. Decide where the moulding should be and make a template for the shank-mounted bearing to follow. Several passes are advisable. You can use cutters to add other details, such as a small ovolo around a drawer edge or moulding a lighting pelmet or worktop upstand. 13-17 Decor panels are often fitted on blank white cabinet ends to make them match everything else. These can be made from anything, from just veneered ply or MDF, or they can be framed up like a door. Don't forget that underneath the base units you will need a plinth or kickboard. This can be in matching timber and is held onto the plastic legs that support the units using special spring plastic clips. Simply screw them in the correct positions and push the kickboard straight onto the clips and it will hold in place. Another thing that is easy to miss in the scheme of things is the need for infill or scribing strips between units and uneven walls. Again these can be in the same wood and need to be carefully cut and trimmed until they fit neatly in the gaps, then set back by, say, 20mm and screwed in place from the inside of the carcass. Finally, remember that having got the routing setup working perfectly, it is as easy to make an entire kitchenful of door and drawer fronts as it is to make just one of each, it simply takes longer! "Setting the scribing strips back looks better and tends to reduce the impact of any gapping that is remaining"
This project doesn't cover worktops as such but they are essential of course. There are several options including expensive granite, postformed Formica-faced and solid wood. The latter two can have a wood upstand biscuited along the back edge. 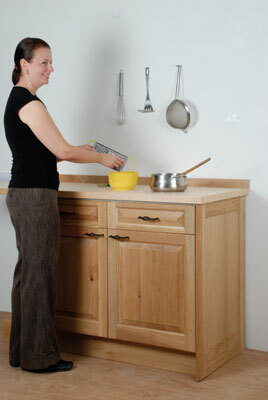 It is wise to choose a contrast wood and definitely avoid oak as it will stain when it gets wet. Maple is dense and hard and is therefore a much better option. You can order ready made up hardwood worktop sections from good timber yards.